Waifs - abandoned and put up for disposal at an area yard sale, these sisters were rescued by Dempsey Essick's wife, Shelley, for only IO¢ each. "I thought the price read $10 when I ran up and grabbed them," Shelley said. "And I would have paid $10 each for them. They are among my most prized possessions. I even have it in my will that John gets the one in blue and Beth the one in red." After a caring sponge bath, both girls emerged bright eyed and happy, ready to bring joy into the lives of every little girl of whatever age. 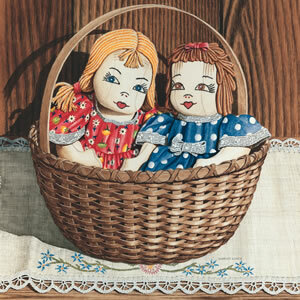 Dempsey Essick has placed the two dolls in a beautiful hand woven basket on a handmade table runner. His faithful rendering of the fabrics as well as the wood grain of the basket is unexcelled. The viewer is tempted to touch the picture just to be reassured that it is indeed a flat watercolor print. Dempsey has chosen this painting as to be reproduced as his 2000 Christmas ornament. The keepsake, which will proudly adorn any tree or may be placed on a ribbon and worn as a necklace, is available through the Essick Gallery.